The other section of the upper floor of Fort Erie's Building Which Is Not the Barracks (sorry, I don't know what else to call it!) is dedicated to Indians, by which I of course mean Native Americans, which in this case would really be Native Canadians, which in this case would be the Iroquois. As we are all aware, Native North Americans played an important role in the conflicts that took place in this part of the world in the 18th and 19th centuries, but they didn't build starforts, so it's difficult for me to give much of a flying war whoop about them. Which makes me a flaming racist, I'm sure, but...starforts. Build me a starfort, and I'm interested. 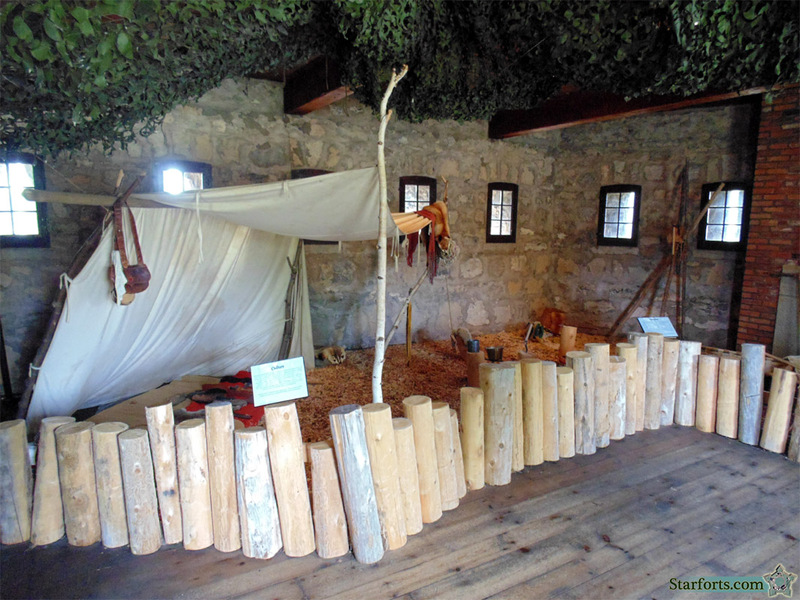 This exhibit depicts an Iroquois encampment, featuring items that would typically be brought on campaign by Iroquois warriors. None of which were starforts.